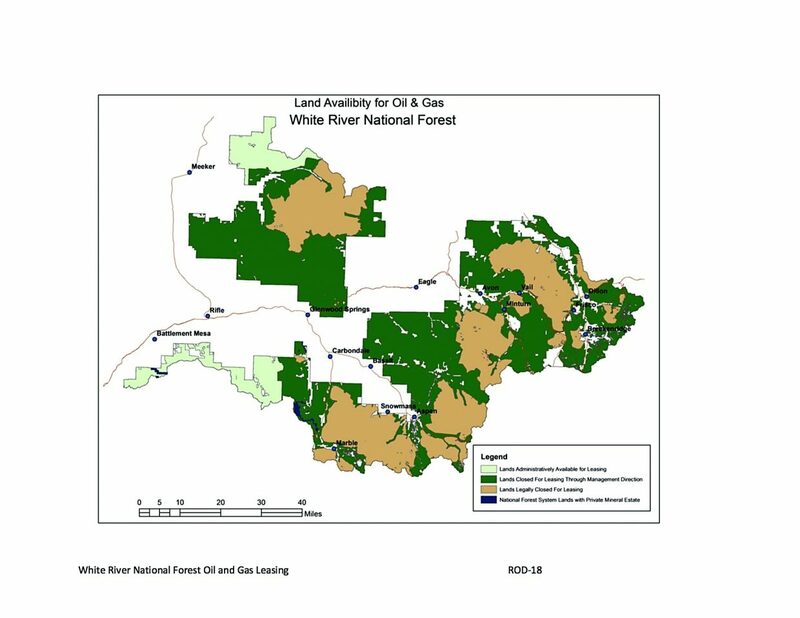 A map accompanying the new White River National Forest oil and gas leasing management decision shows the areas that will remain open to new leasing along the Garfield and Mesa county lines at the southwestern edge of the forest, while closing the Thompson Divide area south of Glenwood Springs. A new White River National Forest oil and gas leasing plan released Tuesday drew a mix of praise from those wanting to keep drilling out of the Thompson Divide region to complaints from some conservation groups that plan doesn’t offer enough protections. Meanwhile, at least one industry representative claimed the new directive is politically motivated and could be used to cancel gas leases that have already been issued. “This is a huge victory for the Thompson Divide and for inventoried roadless areas,” Peter Hart, staff attorney for the Carbondale-based Wilderness Workshop, said during a telephone press conference organized by the Thompson Divide Coalition. The plan proposes to close most of the Thompson Divide area west of Carbondale to new leasing for the 15- to 20-year term of the plan. It also stipulates no surface structures for any leases issued within designated forest roadless areas. The plan does not affect about two dozen existing leases in the Thompson Divide area, which are under separate review by the Bureau of Land Management. However, the BLM has indicated that it will likely take the new forest plan into consideration as it decides whether to allow the existing leases to continue, or possibly cancel or modify some of those leases. 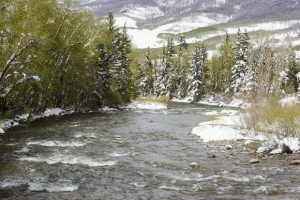 Hart said it would have been better to halt further leasing anywhere in the White River for the duration of the plan, given that it is the most-visited of all national forests and a great deal of oil and gas development is anticipated on other public lands in the coming years. David Ludlam, executive director of the West Slope Colorado Oil and Gas Association, decried the new Forest Service decision. In particular, the move to close off the disputed Thompson Divide seems to be based on “political values” rather than “resource values,” he said. White River National Forest Supervisor Scott Fitzwilliams on Tuesday announced the long-awaited release of the final Environmental Impact Statement and draft Record of Decision for a plan that will guide oil and gas leasing on the 2.3 million-acre White River Forest for the next 15 to 20 years. The plan reduces the amount of acreage available for new leasing by more than half, from 411,475 acres under the former 1993 plan to 194,123 acres in the new plan. Most of the area available for new leasing is in the southwestern portion of the forest straddling Mesa and Garfield counties where natural gas development has proven to be productive, and where the needed infrastructure already exists. That includes the portion of the forest where most of the 65 existing leases also under separate review by the BLM are located, including some that are in active production. Another area of “high oil and gas potential” for new leasing covers the portion of the forest east of Meeker in Rio Blanco County. Otherwise, the vast majority of the White River Forest will be off limits to new oil and gas leasing, primarily because it has little or no potential for oil and gas production. Areas legally closed due to wilderness designation, permitted ski areas and campgrounds will also remain closed to leasing. The unleased portion of the White River National Forest lands in the Thompson Divide, about 61,000 acres, are considered to have “high potential” for future natural gas development, Fitzwilliams said. But in order to maintain the natural character of the area, as well as the wildlife, recreation, ranching, water resources and other values, and due to the fact that little or no natural gas development has occurred in there, Fitzwilliams said the decision was made to close it to new leasing for the term of the new management plan. 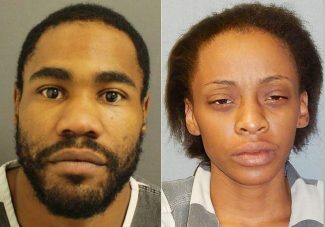 “This was not an easy decision,” Fitzwilliams said in a news release announcing his decision, and again during a separate telephone conference with reporters. The draft plan is still subject to a 60-day “objection” period that will open Friday and end in early February. In the case of the Thompson Divide, public input was “overwhelmingly” in favor of removing the area from consideration for additional leasing, Fitzwilliams said. Members and supporters of the Thompson Divide Coalition’s efforts in recent years to prevent or at least limit natural gas development within the larger 222,000-acre region celebrated the Forest Service decision. The mayors of Carbondale and Glenwood Springs also applauded the forest leasing decision. 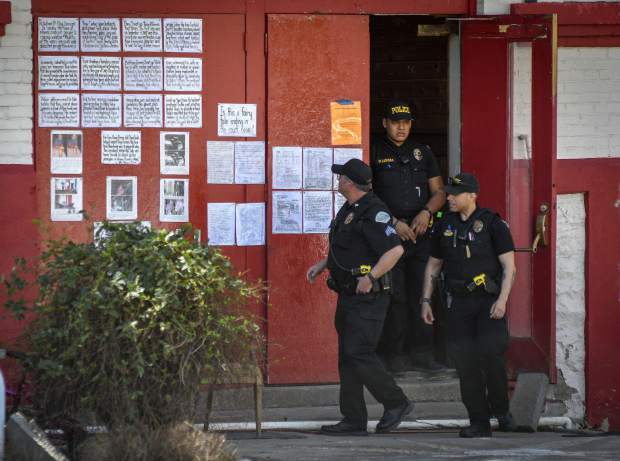 “This is a critical step to protecting the way of life we’ve built in Glenwood Springs,” Glenwood Mayor Leo McKinney said in a separate statement. 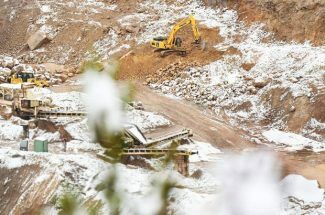 The city of Glenwood Springs has joined Pitkin County and the town of Carbondale in objecting to the continuation of expired leases in the Thompson Divide area, primarily over concerns that Four Mile Road, Midland Avenue and other city streets have been proposed as haul routes for access to the leases. “Thompson Divide is not the right place to drill, and Glenwood Springs is not the right place for drilling traffic,” McKinney said. Carbondale Mayor Stacey Bernot agreed the decision is a step in the right direction. “It recognizes that ranching, hunting and recreation are better suited to the Thompson Divide, and are what we rely on for our livelihood and our local economy,” Bernot said. “Part of the recreation setting that is valued is the quiet and the remoteness from the sights and sounds of human development, clean air and clear night skies,” he said. 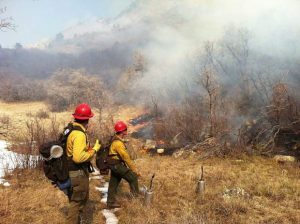 Hunting, fishing and other outdoor recreation groups also applauded the Forest Service decision, as did U.S. Sen. Michael Bennet, D-Colorado. “This study reflects what most Coloradans already know — that the Thompson Divide, a driver of huge economic growth in the region, is not appropriate for oil and gas development,” said Bennet, who has introduced a bill that would permanently withdraw unleased parts of the Thompson Divide region from future leasing. The forest leasing plan affects decisions only during the life of the plan, and does not close off the area permanently.